Simplified plumbing packages now shipped with all Hydratec John Deere tractor conversions. This large ported sandwich block reduces system back pressure and simplifies plumbing installation. 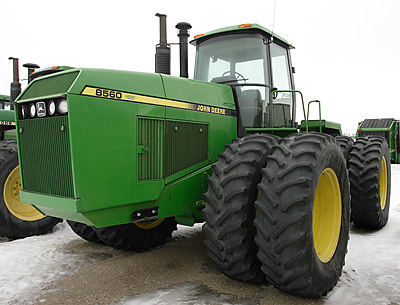 It will work with all 30 / 40 / 50 / 60 / 70 series tractors with conventional SCV’s. This block is not the John Deere power beyond part # AR71331 sold thru parts or sales. This package reduced the back pressure on an 8760 from 500 psi to 50 psi. Other special plumbing packages exist for Cat, Versatile and other Century series John Deere tractors. 1. Install sandwich block in SCV of your choice. 2. Plug one -12 orb port of your choice. 3. Locate stacking quick coupler clamp at a point convenient to you. Weld base plate to tractor. 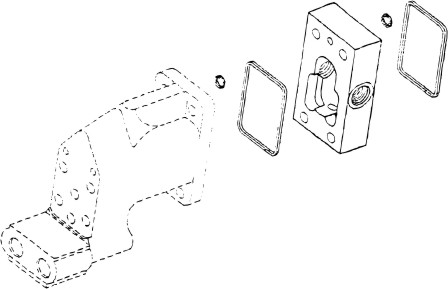 You must disassemble clamp before welding or element halves will melt. 4. Install ¼” case drain quick coupler and ¾” quick coupler in clamps. The ¼” sleeve is clamped in stacking clamp but the sleeve on the ¾” hose is clamped onthe return line. to connect between adapter and quick coupler. There is enough hose supplied in the basic kit to accomplish this. from female quick coupler to bottom of sandwich block. 6. The pressure oil supply for the motor will come from one coupler of your SCV. 7. Return line from motor goes to ¾” quick coupler to sandwich block.